I have received my test scores for my ( ACT) and/or (SAT), and wanted to let you know where I am at. I scored a (___) on my (_____) and a (_____) on my (_____). Also, I checked my cumulative G.P.A., which is a (_____) as of today. 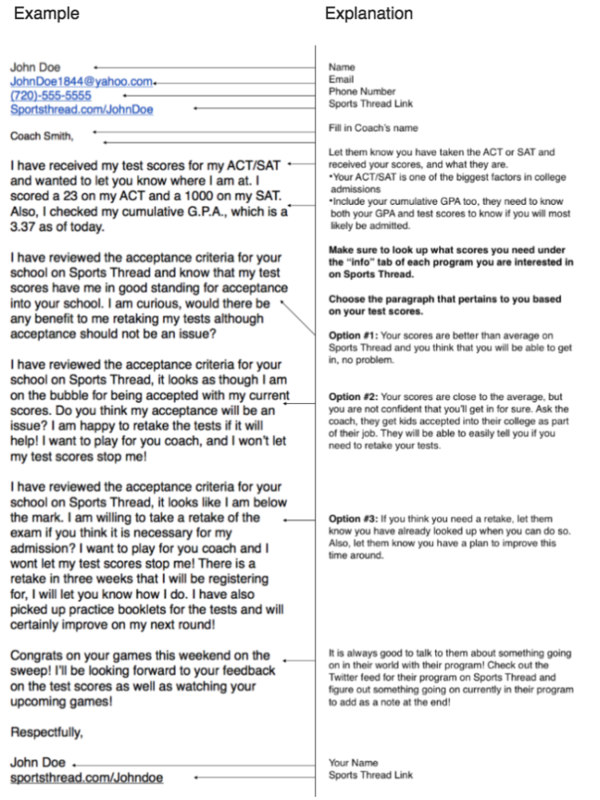 I have reviewed the acceptance criteria for your school on Sports Thread and know that my test scores have me in good standing for acceptance into your school. I am curious, would there be any benefit to me retaking my tests although acceptance seems like it should not be an issue? I have reviewed the acceptance criteria for your school on Sports Thread, it looks as though I am on the bubble for being accepted with my current scores. Do you think my acceptance will be an issue? I am happy to retake the tests if it will help. I want to play for you coach, I won’t let my test scores stop me! I have reviewed the acceptance criteria for your school on Sports Thread, it looks like I am below the mark. I am willing to take a retake of the exam if you think it is necessary for my admission? 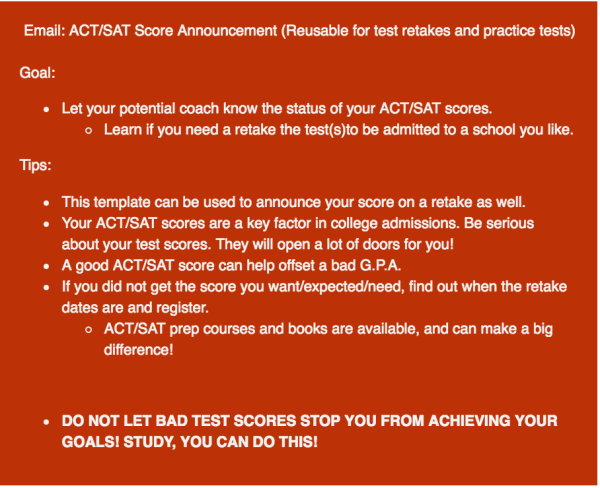 I want to play for you coach, I wont let my test scores stop me! There is a retake in (_________) that I plan to register for, I will let you know how I do. I have also picked up practice booklets for the tests and will certainly improve on my next round! (Add a note about what is going on with their program here). I am looking forward to your feedback, and continuing this process with you.